MDOT has found a way to replace a 13-mile stretch of I-75 sooner than originally planned thanks in part to creative financing. Originally built in 1960, the vintage freeway is constantly crumbling with every winter touch, so bringing I-75 into the 21st Century is a top priority for MDOT. That is why the rebuild of the stretch in Troy with major pothole problems will begin this spring instead of in 2024 as originally planned. Rob Morosi, a spokesman for MDOT, says the company won't have to close the freeway to do it. 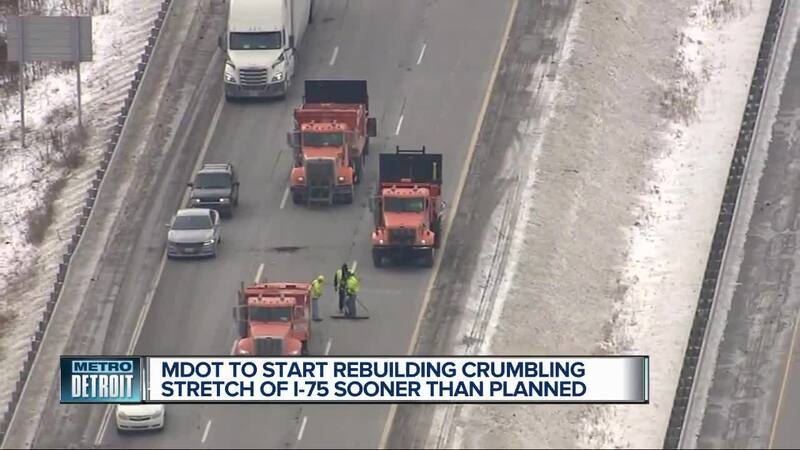 (WXYZ) — MDOT has found a way to replace a 13-mile stretch of I-75 sooner than originally planned thanks in part to creative financing. Originally built in 1960, the vintage freeway is constantly crumbling with every winter touch, so bringing I-75 into the 21st Century is a top priority for MDOT. That is why the rebuild of the stretch in Troy, with major pothole problems, will begin this spring instead of in 2024 as originally planned. Rob Morosi, a spokesman for MDOT, says the company won't have to close the freeway to do it. As part of the modernization, ramps at 14 and 16 mile roads will be getting a diamond upgrade. It's actually called a Diverging Diamond Interchange, which is designed to reduce left turns in front of oncoming traffic, ideally reducing crashes as well. Diamonds would be a driver's best friend, but it's private investors that turned this 18-year project into one that will only take a handful of years. Work from 8 mile to 13 mile will begin this year also thanks to a 30-year design build maintain contract, which gets the work done faster and hopefully will guarantee the work is done right the first time. For more information on the Modernize 75 project, visit: http://www.modernize75.com/.